Some things are hot like a kettle boiling, or a toasted teacake fresh from the oven. Some are cold like an outdoor swimming pool in autumn. But if you think those things are hot and cold, check out the stuff in this book. Hotter than a solar flare and colder than a polar bear’s paws! Have you ever wanted to walk inside a volcano’s crater? Or look at Jupiter’s icy moon? 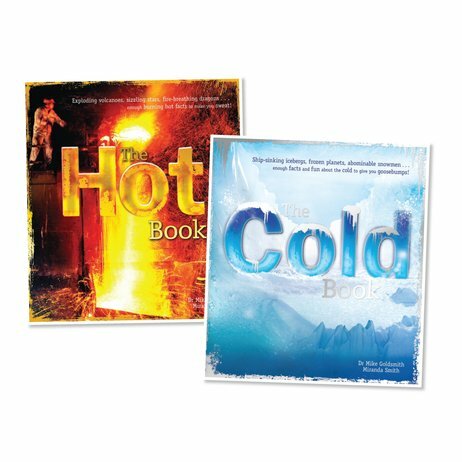 Explore both ends of the thermometer with this cool flip book. Double the chance to blow your mind with awesome facts! IG1080L Lexiles are the global standard in reading assessment. They are unique as they are able to measure a child and a book on the same scale – ensuring the right book gets to the right child at the right time.